Israeli newspaper Ha’aretz reported on Tuesday that the Israeli government spent NIS 1.1 billion on illegal settlements in the West Bank in 2011, an increase of 38 % over the previous year. The article also asserts that an additional NIS 1.6 billion could be saved if government spending on settlers was the same as per capita spending for the rest of its citizens. The head of the Israeli leftist organization Peace Now, Yariv Oppenheimer states, "If the government would just make per capita spending for residents of the settlements equal to spending for the rest of the country's citizens, we would be able to cancel the widespread [budget] cuts and significantly reduce tax increases." This report fails to mention the illegality of all settlements in the West Bank as well as the widespread condemnation of settlements by every nation in the world outside of Israel in an attempt to normalize the occupation and frame the issue as one of economics rather than human rights. There is international consensus that Israeli settlements in the West Bank, East Jerusalem and the Golan Heights constitute a violation of international law and the Fourth Geneva Convention which states that "the Occupying Power shall not deport or transfer parts of its own civilian population into the territory it occupies." The primary judicial organ of the United Nations, the International Court of Justice (ICJ) issued an advisory opinion condemning all settlements as illegal and the reconvened Conference of the High Contracting Parties to the Geneva Conventions did the same. 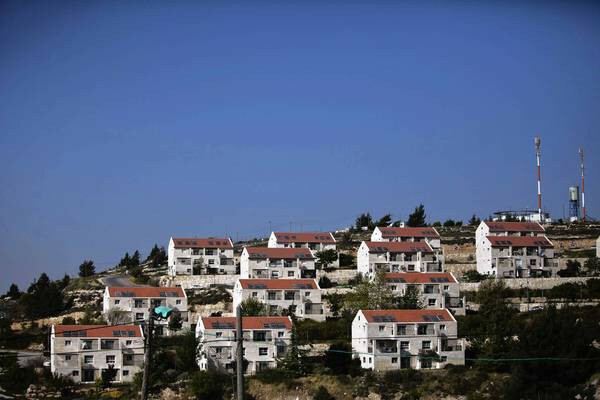 Settlers from the illegal Itamar settlement, which is built on land belonging to the village of El-Khader, south of Bethlehem in the occupied West Bank, have enlarged the colony with a number of mobile homes. Ahmed Salah, the coordinator of the popular campaign to resist settlement in El-Khader, told the local media that the settlers have put 10 caravans on the outskirts of the well-known settlement and started to connect it to the electricity supply. Street lights have been installed on a road which was paved a few days before in the area of Ein Qessies, adjacent to El-Khader village, where settlers have seized just over one acre of Palestinian-owned land. Salah noted that Israel's Supreme Court ruled several years ago that Itamar settlement must be dismantled, but the settlers are continuing to expand the illegal site. The Arab League stated on Wednesday that the Israeli regime escalated lately its settlement and Judaization activities in the occupied Palestinian territories. The Arab League said in a press release that the Israeli regime in recent days started to attack the Palestinian natives and their homes in the villages and towns surrounding occupied Jerusalem and Al-Khalil city. It added that Israel issued decisions to remove eight Palestinian villages and communities south of Al-Khalil city, namely, the villages of Majaz, Tabana, Wasfi, Fakheit, Halawa, Markaz, Janba and Kharruba. The League noted that Israel, through such practices, would render more Palestinian natives along with their children homeless and destroy their farms and means of livelihood in order to establish and expand its settlements in place of their lands. It warned that Israel's escalation of its violations and settlement activities would augment the level of tension and instability in the region. It stressed the need for more active role by the UN, the permanent member states of the Security Council and the international quartet on the Middle East to protect the occupied people of Palestine. Residents of Wadi Al-Maleh in the northern Jordan Valley warned of practical measures taken by the Israeli occupation authorities to convert Givat Salit outpost to a settlement, including construction works and seizure of lands. Human rights sources in the Wadi noted that the Israeli war ministry assigned an engineer to make the architectural blueprint of Givat Salit outpost, which is located in the northern part of the Jordan Valley. Givat Salit was established in 2001 along with 25 other outposts across the West Bank, and today it is being transformed to a fully integrated settlement. Arab Spring is ultimately against the interest of Israel as the Arab nations, who secured a revolution against pro-Western government, have supported the Palestinian rights for the past 64 years, a political analyst tells Press TV. “As a principle, the Arab Spring actually is the manifestation of the Arab people’s will for change and to replace government, which normally supports the Western policies in the Middle East, like Egypt and Tunisia, and other places,” Iraqi analyst Sabah Jawad said in an interview with Press TV. and divert attention from the protesting Arab peoples’ dreams of the return of the Palestinian people to their homeland, the analyst also said. Considering the illegal settlement building in the Occupied Territories colonization of Palestinian lands, Jawad said there was an 18-percent increase in the population of the people, accommodated in the settlements, since Israeli Prime Minister Benjamin Netanyahu came to power three years ago. The Israeli regime has tried to attract “a lot of Jewish immigration to Palestine. They come from the former Soviet Union, Russia, and also consist of Eastern Europeans and Americans, and they are giving them huge incentives to be part of this colonization,” he added. 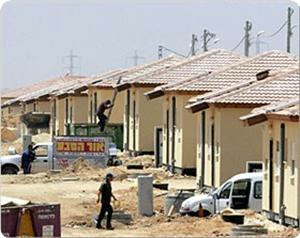 On June 6, Netanyahu ordered the construction of 300 settler units in the illegal settlement of Beit El in the occupied West Bank. All the Israeli settlements across the West Bank are regarded as illegal under international law. More than half a million Israelis live in over 120 illegal settlements, built since the 1967 Israeli occupation of the Palestinian territories in the West Bank and East al-Quds. The Israeli outpost of Ulpana adjacent to the Beit El settlement is being evacuated this summer, under protest, at the behest of the Israeli Supreme Court. It, like other settlements and outposts, was built on private Palestinian land. For most Americans, the word "settlement" conjures up images of the Old West, of a small outpost with a post office, general store and a saloon. A dot on the map. A threat to no one. The settlements in the West Bank of Palestine, however, are quite another story. Dotted across the territory occupied by Israel after the 1967 Middle East War and not recognized as legal by any international body, the settlements are developments of 5,000 to 30,000 Israeli citizens. While many look like the gated communities of South Florida or Southern California, others are concrete high-rise cities rising out of the desert floor where there are thousands of homes, stores and even industrial parks. No Little House on the Prairie here. Some settlements, like the Ulpana expansion of Beit El, which is being evacuated this summer, under protest, at the behest of the Israeli Supreme Court, are built on private Palestinian land. All, however, are built on lands that have been owned and farmed by Palestinians for hundreds, if not thousands, of years. 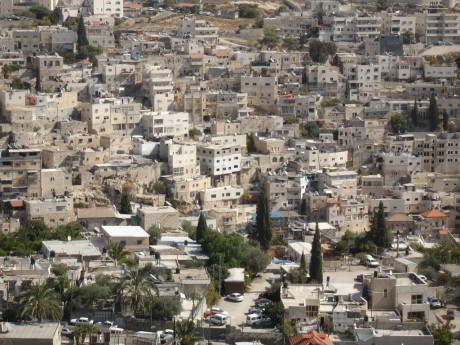 Typically the settlements are built on higher ground, towering over the Arab villages around them and from which they take land when they wish to expand. These actions have been justified by the declaration of the lands as "Area C" under the Oslo agreements. The agreements, which were meant to be a five-year temporary solution when forged in the 1990s, are still in effect and give the Israeli military full authority over the occupied territories and the right to expropriate land and destroy Palestinian homes, fields and buildings as desired, virtually without challenge. A visit to Kefr Al Dik, a village 20 miles west of Tel Aviv, provides a glimpse into the meaning of settlements and occupation. It lies at the foot of the hill occupied by the Arial settlement. Without a modern drainage system, Arial's waste flows untreated into the streams upon which Kefr Al Dik traditionally relied for water for its homes and olive groves. All the water in the West Bank is under the control of the Israeli military. Arial is granted a ration of 200 liters a day per citizen; Kefr Al Dik is granted 30 per resident each day. When I was there recently, the town had been notified that the Israeli military was taking another 30,000 acres for settlement expansion, and the children of my host had arrived home the previous week to find dozens of soldiers guarding the bulldozer that was in the process of demolishing the water well and shelter adjacent to the family olive grove. As heart-wrenching as such stories are, the issue of the settlements goes far beyond personal tragedy. The settlements are not random. They surround Arab villages on all sides, separating village from village and all of the Palestinian land from any external border. 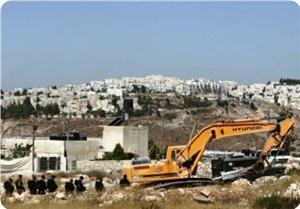 If the settlements continue or, more to the point, are not removed, there will be no possibility of a contiguous state. 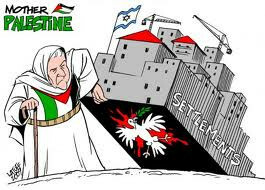 Moreover, one can imagine from looking at the map of settlements that what Prime Minister Benjamin Netanyahu has in mind for his "unilateral Palestinian state" is a fragmented set of Palestinian settlements connected by underground roads and all bordered by the state of Israel. Kind of like what we in the U.S. did to the Native Americans. However, this is not the 19th century, there is an international human rights community and Israel is not surrounded by two oceans but by numerous Arab states that, in the midst of their own struggle toward democracy, are not likely to see the creation of a internal client state whose borders, water and trade are controlled by Israel as a just or friendly move. We as Americans have a great deal at stake in the fate of the settlements and Israel. The "apocalyptics" may welcome the inevitable conflagration that would likely follow a lopsided resolution of the Israel/Palestinian question. The rest of us, those who value life, peace and the justice upon which peace must be based, have a responsibility to press for a better resolution. Marilyn Katz is the president of MK Communications in Chicago. She is a member of the national steering committee of J Street, which describes itself as a pro-Israel organization that supports a Palestinian state.